One of the most exciting parts of running Unity Marketing comes when we can help businesses, especially small and mid-sized businesses, translate research-based insights into actionable marketing and branding strategies. Recently, we were able to make a difference when asked to consult with Davids Furniture & Interiors. Large companies often maintain expensive market research departments dedicated to gathering and mining data and interpreting it in detailed ways to guide business decisions, but most small and mid-sized companies don’t have that luxury. 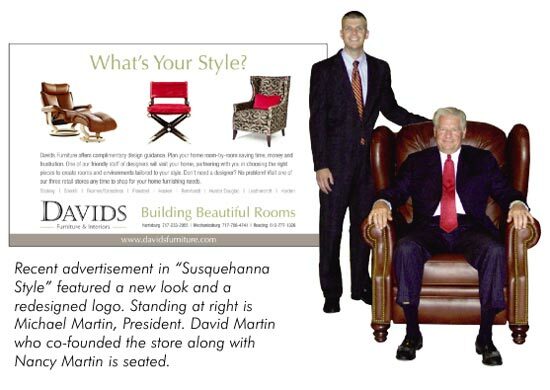 That was the case for Davids Furniture & Interiors, a central Pennsylvania chain of prestige furniture stores servicing sophisticated and discerning home owners with an eye toward design. We used our research-led approach to identify ways Davids, celebrating its 40th year in business, could make small changes that would generate big results. For example, one of the stores displayed a sofa that was set too close to the front door. The sofa crowded the customer, effectively pushing them back out the door, rather than inviting them in. In retail, it is critical to provide customers a 12-14 foot ‘decompression zone’ upon entering the store, where the customer can transition from outside and get ready to explore the retail environment. Davids needed to push back that display and give the shopper transition room to get oriented to the store. Next, special attention needed to be paid to what is displayed to the right after the decompression zone. The space to the right of the door is prime real estate in retail, as that is the typical path for shoppers as they move through a store. Another of Davids’ stores was not effectively using that prime right-of-the-door retail space. Ekorne’s Stressless Collection is one of that store’s top-selling brands, but it was displayed in a separate gallery toward the back of the store. Rather than have customers search out that line, it was moved to the highly visible location inside the right front door. In that way, Davids put their best ‘foot’ forward utilizing that high performing space to its maximum and giving an immediate boost to sales of the Ekorne line. We made similar changes to the way Davids Furniture & Interiors handles its pricing, promotion, marketing, branding and advertising.